Laughable—maybe—but I've been addicted to highlighting my blonde hair since, oh, about fifth grade. What started off as thin, cringe-worthy zebra stripes (in my defense, it was the trend) has now transformed into years of bright tightly packed foils, which provide more dimension than a basic bleach job but nonetheless leave me 98% allover blonde. My point: 14 years later, and I'm pretty much an expert when it comes to blonde hair tips. I kid. Except, I do know what I like, and having sat in the chairs of more colorists than I can count on both hands—from my hometown in Minnesota to Ireland to Los Angeles—I've had the chance to pepper many an expert with all of my burning haircare inquiries. And considering I've been through hair hell and back again, I take every opportunity with a new colorist to peck for details, insights, tips, and tricks. Not surprisingly, I have hoarded quite the repertoire of intel over the years. So though I'm not an expert in coloring—far, far, far from it—I would say I have a knack for knowing how a colorist will answer my questions. As the go-to colorist of such blonde beauties as Rosie Huntington-Whiteley, Kate Hudson, and Ciara, celebrity colorist Cassondra Kaeding knows a thing or two about a breathtaking color job, splitting her time between Mare Salon in L.A., Sally Hershberger Salon in NYC, and bookings in Dubai, India, as well—casual. Suffice to say, I couldn't have been more excited when I was offered the chance to sit in her chair a few weeks back for a quick consultation and color. Obviously, I expected to walk away with fresh, shimmering shades of blonde (and I did), but what I didn't expect was to have six brand new blonde hair tips up my sleeve. And since keeping blonde hair healthy and shiny is basically the ask of the century, I thought I'd share the wisdom. Plus, it's my job. Keep reading for six blonde hair tips (you probably haven't heard) straight from Kaeding, herself. No one will ever dispute the must-have allure and benefit of Olaplex. Since it's debut, almost every single colorist I've seen has sworn by the stuff, incorporating steps one and two (which require in-house application) into my hair transformation. Then, as I prepare to go on my merry way post-color, I've always been advised to use the brand's No.3 treatment at least once or twice a week to maintain the integrity of my hair. As the product possesses a patented active ingredient that works on a deep molecular level to target and repair broken bonds of hair (without any danger of over-proteinizing like other intensive treatments on the market), everyone from Lili Reinhart to Zoë Kravitz swears by it. And Kaeding does too, just with one important stipulation: Don't ever fall asleep with Olaplex in your hair. As a common offender of doing just that, I immediately recoiled. "But I thought there was no such thing as leaving it in too long," I sputtered. "You're right," Kaeding agreed. "But that's not the problem." 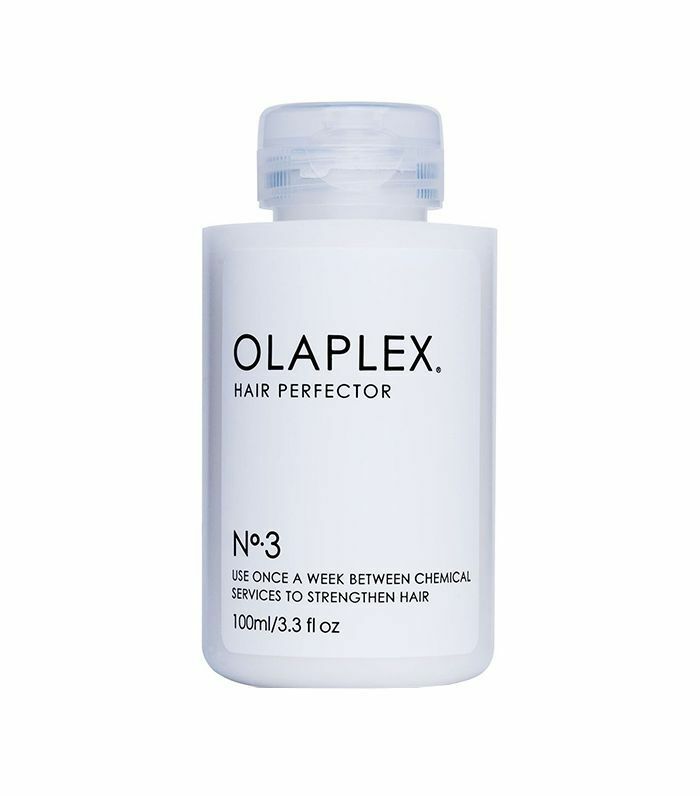 Since it's ideal to apply the No.3 to towel-dried hair, after it's been in your hair for a while (and starts to dry—as hair does), the Olaplex-saturated strands will dry crispy. So, if you hit the sheets with your hair stiff and sticky, the likelihood for breakage is much higher and you may as well kiss all those baby-fine bits along your hairline sayonara. Instead, do as Kaeding suggests and follow the product instructions to the T: Apply to clean, towel-dried hair, comb through, and let marinate for 10 to 90 minutes—the latter being optimal. When it comes to maintaining the health and happiness of blonde hair, there's understandably a lot of buzz about protein. After all, bleach strips your strands of the very stuff, so wouldn't it makes sense to pack as much as humanly possible back in? According to Kaeding, not quite. In fact, you're better off concentrating your efforts on moisture, instead. "Moisture is paramount. For example, if you are a blonde, your colorist uses bleach to highlight. Bleach strips out protein and the natural minerals and oils your hair produces. Once all of this is gone from your hair, it can feel a bit dry and also look flat. Putting the moisture back in will help make your hair look and feel much better and you can do so by using a color-safe, nourishing shampoo and conditioner." Kaeding tells me she's a big fan of Dove's Nutritive Solutions Color Care Shampoo ($6)—a luscious drugstore pick that's specifically formulated to protect and preserve the vibrancy of your color and safe to use on a daily basis. 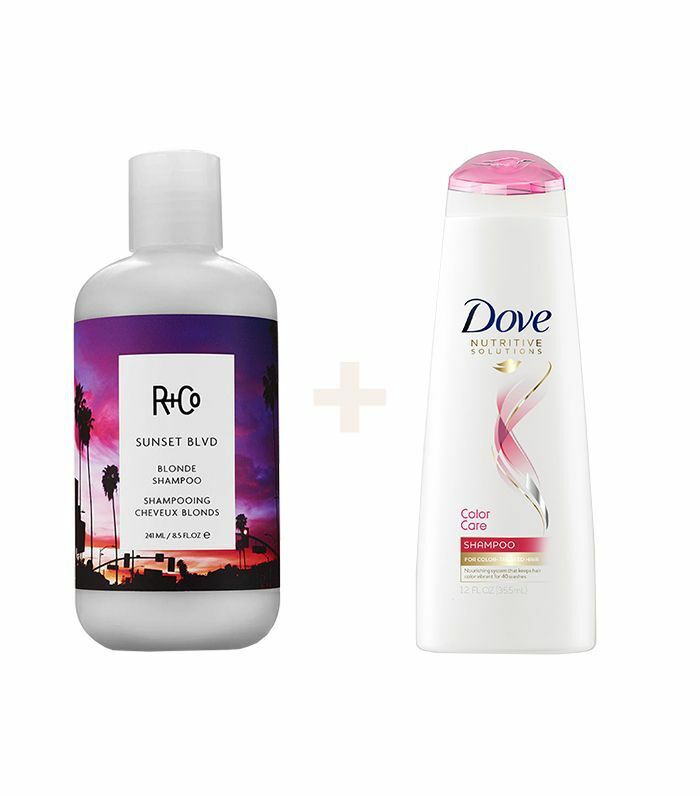 "For my bleach blondes, a bi-weekly treatment with purple shampoo, in addition to using a color-safe shampoo like the Dove option mentioned above, is an absolute must. While your color-safe shampoo keeps your hair vibrant, the violet pigments in purple shampoos are an added bonus for blondes, as it works to tone our brassy tones, which are a result of oxidation. Make sure to only use the purple shampoo once every two weeks, though, as using it too frequently will make your color look dull and flat," explains Kaeding. Noted. As someone who tries new hair products like it's my job (oh wait, it is), I'm definitely guilty of trying a product just once or twice before deeming it "over-hyped," "unmagical," or just plain "meh." But as Kaeding explained to me, hair products typically aren't designed to be immediate, one-time wonders. Their benefits take time, and you usually have to stick to a product for at least a few weeks—maybe even months—before seeing its actual result. Of course, if you have some kind of reaction, by all means, cease usage, but if you're simply convinced it's not working as you thought it would, Kaeding's advice is to stick with it. "Don't give up on a product after just one or two washes. Make sure that you are using a product as instructed and consistently so you get the full benefit!" Though there are many myths when it comes to hair color and maintenance, according to Kaeding, this is a biggie. Many people tend to think going blonde doesn't necessarily require bleach. and as someone who thought only ultra-light shades required the stuff, I'm as guilty as the next person. "Some clients think that going blonde doesn’t involve bleach, but this isn't true. In order to lift a color, you must highlight with a bleach to get the desired results." Plain and simple. Truly, your colorist has your hair's best interest in mind and will be able to recommend the healthiest course of action. Kaeding says it best: "Don't over-highlight or bleach your hair. It's so important to listen to your colorist! If she or he doesn’t want you to come back for a touch-up for at least eight weeks, my best advice is to listen. In the end, this will save your hair from any irreversible damage." Next up: the prettiest balayage hair colors all in one place.